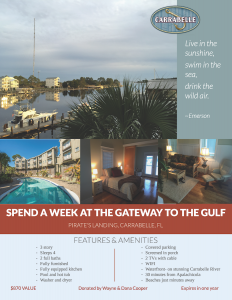 Win the Chance to Spend a Week at the Gateway to the Gulf – Alumnae Panhellenic of Tallahassee, Inc. This condo, along with an amazing array of gift baskets, a Waterford Crystal Cross, jewelry, baked goods and more, will be part of the 2017 Scholarship Luncheon auction, proceeds of which go directly to fund scholarships for Panhellenic women at Florida State University. If you haven’t RSVPed for the Luncheon yet, please click here.